I’ve heard people say that you shouldn’t overtly blog about your product or service because it might turn people off. They might consider it spam and discount your views and opinions. Well, for this blog post, I’m not going to heed their advice. I am going to tell you why I think our product is remarkable. Here goes … It saves you money. I’ve always known that I can build a capability faster on the BioIT Platform than if I were to write custom code. But now I have a great deal of evidence that backs up my intuition. 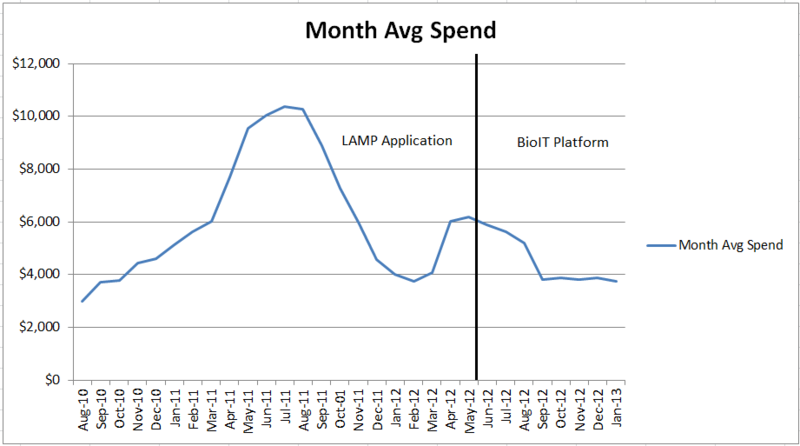 Last year, I converted one of my clients from a single-purpose LAMP application, (LAMP stands for Linux, Apache, MySql, PHP) to the BioIT platform. Together with this customer, we’d spent three years developing the LAMP application. Now, as we approach the 6 month point of moving them onto the BioIT platform, I thought I would compare the before-and-after costs. Figure 1 shows the monthly spend that this particular client bore. In late 2010, the client began making significant investments in informatics as seen by a steep ramp up in monthly spend. This peaked in late 2011, when together we decided to move to the BioIT platform. In essence, it was becoming too costly to write single purpose code AND, it was hampering BioIT’s ability to scale. The downward spend that happened from late 2011 until early 2012 was largely attributable to the fact that BioIT did not charge the customer for the port. Since the customer had paid for the initial LAMP development, we felt it was not fair for them to pay for the same rehosted features. The black line shows the “Go Live” date for the customer on the BioIT platform. Notice a small uptick in spend that occurred immediately before and after the go-live. This was caused by some pent-up demand for features that had been neglected during the port. And now, it is becoming clear that the spend has flattened out at an attractive level. One more thing. This customer has doubled their business in the past year. Their informatics needs continue to become ever more sophisticated. But now that they are running on the BioIT platform, we can respond quickly and economically. Please email us at sales@bioit.com to learn more about the BioIT Platform.